An unusual mix of ink-painted backgrounds, cartoon animations and improvised typography designed with oil pastel crayons. The main title for Fantômas se Déchaîne (original title) is credited to Berthon Films. But who was the creative force behind this forgotten studio? This quintessentially French piece of animaton could not be left uncredited. It took a little bit of digital digging around, but finally, with a little help of Google Books, I found myself with a phone number. Some unanswered calls later, I hear a shrill voice, almost like a little girl's. Wrong number? No, it really is Lucienne Berthon, creator of the main title of Fantômas se Déchaîne at the other end. So I meet this petite 85-year old woman the next day in her studio in Neuilly-sur-Seine, a suburb of Paris. This place is a veritable museum! Paintings and animation cels cover the walls. She has kept the two cameras she worked wit, which date back to the 1940s and 1950s. This woman, who has managed her own animation studio at a time when feminists were just beginning to make their voices heard, is delighted to talk about her passion for painting and animation. She is also a woman who is fascinated by my iPhone, because she hasn't been keeping up with technology in recent years and does not quite seem to realize the extent to which computers have revolutionized everything. Lucienne Berthon is a veritable encyclopedia on the history of animation, whose long and fascinating career deserves to be honored during her lifetime. Fantômas se Déchaîne is the second installment of the “Fantomas" trilogy directed by André Hunebelle starring Jean Marais in a double role as the criminal Fantômas and as journalist Fandor, and the French comedian Louis de Funès as Commissioner Juve. Both men are well-known actors in France: Marais starred in the films of his former companion, Jean Cocteau. De Funès was the king of the French comedy between the mid 1960s to the 1980s, but he was known throughout Europe. 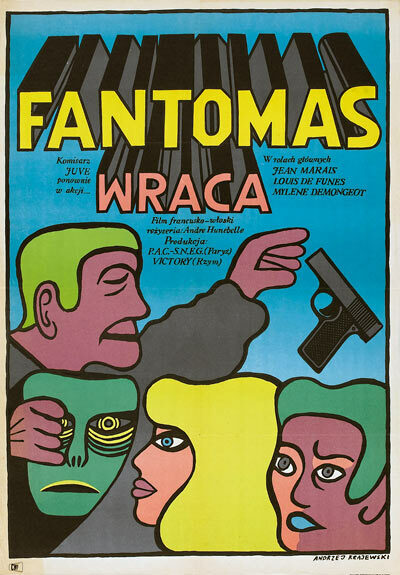 As with most films produced by the French film production company Gaumont, "Fantomas" was developed by the illustrious French post-production studio GTC laboratory. GTC approached Lucienne Berthon, an animator and visual artist, to create the main title. The idea behind the title sequence, recalls Berthon, was to recapture the credits from the first "Fantomas" film, but in a more naive style. Berthon asked a cartoonist to draw portraits of the leading stars Marais, De Funès and Mylene Demongeot. However, Demongeot's fine features proved very difficult to reproduce in the cartoony style. Finally, Berthon drew a blooming flower that unfolds, revealing a photographic portrait of the actress. Demongeot was quite affected by this poetic metaphor, Berthon remembers fondly. The typography is designed with oil pastel crayons in an improvised style as if to make the type "dance with the animation." Berthon worked with ink to create the colored backgrounds in the same way she would paint her paintings. As for the music, Berthon timed her storyboard and asked the composer, Michel Magne, to write the music in a rhythm according to her instructions. Lucienne Berthon also did the visual effects for the last scene of the film where a flying car writes the word "End" in the sky. This is the only film title sequence she ever create. was designed by Andrzej Krajewski. Text: Laure Chapalain, © SubmarineChannel 2011. Born in 1926, Lucienne Berthon was already a gifted artist at an early age. At the age of 16 Berthon won a drawing prize from the City of Paris. She immediately joined one of the first French animation teams directed by Albert Dubout, but stopped after a few years to devote herself to painting. In 1955, she founded her own production company, Les Films Berthon. The company would create over 50 hand-drawn animated films as well as live action productions. With the advent tof computer assisted animation production, her talent for creating hand-drawn animation gradually became obsolete. She then returned to painting and exhibits her work all over the world. Berthon lives in Neuilly-sur-Seine, a suburb of Paris.